Captain Edward Burt, 18th century English traveller and chronicler. A lifelong diet of seaweed combined with wild seashore living gives the North Ronaldsay breed a dark and intensely flavoured meat. Gourmet lovers and top London restaurants favour the seasonal meat because of its strong taste – comparable to wild duck – ignoring the outdated idea of ‘mutton’ being the less glamorous choice next to ‘lamb’. 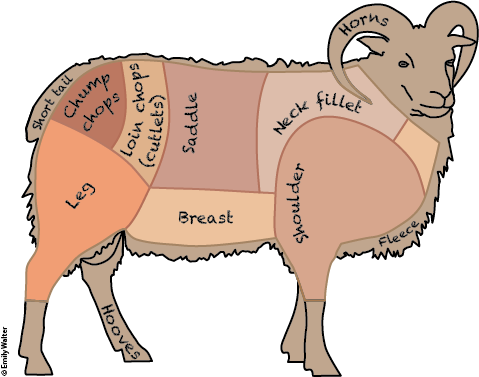 In the case of the North Ronaldsay sheep, the wait is key to the meat’s gastronomic significance. “Champions of North Ronaldsay mutton hold it in the same regard as prosciutto ham, truffles or caviar as it has a unique flavour. The meat is lean and has a distinct gamey taste”. So prized is the rare taste that North Ronaldsay mutton was chosen as the dish to kick-start the Diamond Jubilee Celebrations for Her Majesty the Queen and the Duke of Edinburgh, cooked by celebrity chef Cyrus Todiwala OBE of Café Spice Namasté. For the main course, Todiwala created an Indian version of the British classic shepherd’s pie called ‘Country Captain’, with the North Ronaldsay mutton cooked in spices, a red onion and tomato gravy, and topped with cumin-flavoured mashed potato before being baked. He also cooked the dish on BBC1’s Saturday Kitchen. To show his support of The Orkney Sheep Foundation and the rare breed, Cyrus Todiwala has generously given us the recipe for the very dish that he presented to Her Majesty the Queen, so that foodies and culinary whizzes can reproduce this fantastic and flavoursome meal at home. Roast the cumin & coriander on a low heat until they change colour slightly and cool. In a blender grind together the ginger, garlic and the roasted cumin & coriander to a fine paste with only as much water as is necessary to make the paste. Peel the potatoes, remove any spots, wash and keep them soaked in water. Later boil, drain and pass them through a ricer and set aside. In a large casserole big enough to take the leg of lamb, add the oil and heat until a light haze forms on the surface. Reduce the heat a little & add the pieces of shoulder. Remove the meat from the casserole and add the whole spices & the red chillies broken into pieces. Sauté for a minute or so on a medium heat until the cloves swell a bit and deglaze the casserole with a little water to release the residue from the meat stuck at the base. Scrape with a wooden spatula until the base is scraped clean and add the chopped onions. Continue cooking until the liquid evaporates and the onions are now being sautéed. Sauté until the onions are soft and add the ground masala. Add some water to the container to release any stuck masala and add this to the pan too. Continue cooking for five to six minutes and put the meat back into the casserole. Coat it well with the masala, check seasoning and add salt as desired. Lower the heat a bit, cover the pan tightly and continue cooking the mutton. At this stage if your casserole is an oven-able type put the casserole covered into the oven at approximately 140°C. After about fifteen minutes remove from the oven and turn the meat and put it back into the oven. If cooking it on the cooker turn the meat after ten minutes or so and also check to see that the contents are not burning at the base. In either case if the contents dry out too much, or the onions are burning in case of cooking on the cooker, add some water or stock to loosen the contents at the bottom of the pan. In another twenty to thirty minutes or so the shoulder should be approximately half cooked. At this stage add the chopped tomatoes and if necessary some water or stock, cover and continue cooking for another ten to fifteen minutes. When the mutton is almost cooked the muscles will have retracted and the meat will itself feel soft to the tough. If in doubt insert a thin skewer or a roasting fork and check to see if the fluid released is running clear. When the mutton is done remove it onto to tray and also remove any gravy stuck to it. For this dish the meat needs to be quite overcooked actually. Check the gravy and remove all the whole spices carefully if possible. Cool the mutton and then remove it off the bone shredding it as you go along and adding it to the gravy. Return to the heat and cook very slowly until the meat and the gravy almost dry to a thick consistency. Add freshly chopped coriander check seasoning and remove contents into a casserole dish leaving approximately 3/4th of an inch from the top. Finely chop the garlic and shred the red chilli. Heat a little butter, add the cumin seeds and let them colour gently but do not over heat, as the butter will burn. As soon as cumin changes colour remove and add to the potato with as little butter as is possible. Add minced garlic to the butter and sauté for a minute or so. When pale add the spinach leaves that have been coarsely shredded, toss for a minute or so until soft, season gently and remove. Now blend the eggs into the potato and cream them until soft and smooth, check seasoning. Spread the potato over the spinach evenly, ruffle the surface a little, it does not have to be smooth, just evenly spread and bake in the oven at the same temperature. Raise the temperature after a few minutes to get a nice colour on top. Serve with hot bread or steamed rice.